If your AC is not cooling enough, one of the easiest and most important things you can do is check/change your air filter. The second thing you can do is inspect your coils on your outdoor unit and make sure you have nothing restricting air flow. Your AC unit is only designed to maintain. Understand that generally your AC unit can handle a 20 degree difference between indoor air and outside temperatures. So when it is 92 degrees outside, you can expect to get your indoor temperature to 72 degrees if desired. However, if it is 102 degrees outside, your air conditioner may struggle to meet 72 or run all the time trying to meet the demand being that it is more than a 20 degree variance. Air Conditioners must have a filter. The filter will be located inside your home either with the equipment or behind a grille inside your home perhaps a hallway. It is very important that the filter is changed regularly in order to filter the air properly and prevent the indoor coil from getting dirty. (We do not recommend the washable type filters) 1″ filters=change every two months; 2″ filters=change every 4 months; 4-5″ filters=change every 6-12 months. Filters will get dirtier faster if: there are multiple pets, there is a dusty outdoor environment such as dirt roads, fields, construction, etc. ; if carpets are infrequently vacuumed. We recommend buying a year’s worth of filters; so that they are handy when it’s time to change them. 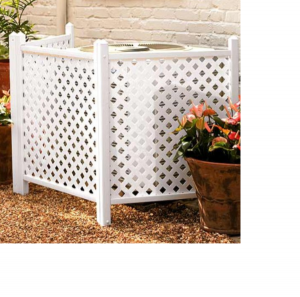 Keep bushes and shrubs at least 36 inches away from the outdoor unit. Keep debris and clippings away from the unit as well. The outdoor unit needs to have amble amount of air flow without any hindrance. Do not build a shed or roof or awning over your outdoor unit and do not place anything on top of it. If you build a fence, make sure you keep it back 36-48 inches. Air blows out the top of the outdoor unit and it needs to be able to blow freely. It is also a good idea to keep pets away from it. They may like to scratch or “relieve” themselves on the coils. Setting your thermostat lower than 70 degrees will not benefit you or your AC system. Trying to cool it “faster” just means that your system could possibly freeze causing more problems. Use your programmable thermostat to set your temperature at 78°. This allows the system to maintain temperature throughout the day. Do not set your thermostat to go off while you are away and then expect that in extreme heat that your AC will be able to pull down to a desirable temperature when you get home. If you have a basic programmable thermostat, do not “off-set” it more than 5 degrees while away (during extreme weather temperatures). Otherwise it will work too hard to bring the temperature to the desired point thus defeating the energy saved. If you see water leaking from an outdoor pipe this means that your primary condensate drain has a problem and the water is traveling through the emergency drain system. This pipe is usually located in a conspicuous area so that you will easily see the water dripping and know that there is a problem. A common misconception is that your AC unit needs to have refrigerant added regularly. Your AC unit does not “use up” refrigerant. If your system is low then your system may have a leak. Some leaks are small and difficult to detect while some are larger and easier to detect and locate with UV dye and leak detection devices. Just like your vehicle, your HVAC unit requires regular routine maintenance by a qualified and licensed HVAC contractor. Call us today (916) 933-2683 to get on our bi-yearly preventive maintenance program. Having your HVAC unit serviced not only helps eliminate emergency services, it also eliminates undue hardship on your system that will be very costly to you as a homeowner.